Partnering at the speed of business requires the entrepreneurial agility to adapt and evolve, especially when pursuing a business transformation agenda. Agility and nimbleness can be quite challenging in complex partnerships that must navigate the strategies, structures, processes, and cultures of two or more companies to get anything done. The task for alliance professionals is to ensure that, collectively, the partners learn fast. If your alliance or partner network is to maximize the value contemplated by its value assumption (See Designing the Why, What, and How of Your MVP - the Minimum Viable Partnership), it needs a process in place to learn about the validity of the components of the value assumption, as well as the alliance business model put in place to operationalize and govern the alliance. 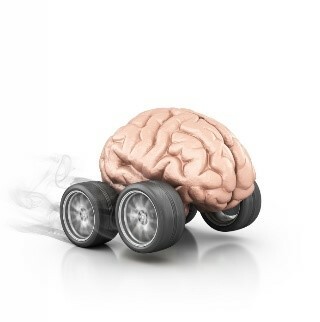 Learning fast has real, quantifiable value, especially in a time of business transformation. It is often said that companies—and by extension, alliances—must fail fast in their innovation endeavors to not waste time and money on lost causes. McKinsey finds that the advantage doesn’t come from being quick to stop something that isn’t working out—it comes from being quick to learn from the failure. Alliance professionals orchestrating the collaborations driving business transformation must help their organizations fail fast to learn fast—to get smart quickly for few dollars. To get smart quickly, alliance professionals are well-served to develop a learning advantage within their alliance and partnering teams. The assumption validation process underpins entrepreneurial agility, the scientific method, and innovative development. It is your Rosetta stone—the decoder ring for learning fast. Learning occurs in iterative cycles. Every cycle begins with an initial level of understanding based on all the information you have at that time. You then make assumptions based on your understanding. Assumptions are your hypotheses about what is true or not true based on your current level of understanding. In our case, everything that goes into the design of the minimum viable partnership is an assumption. Some are based on better information than others. Data is the fuel for the process. 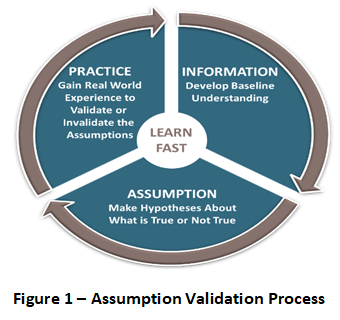 To learn, to know if your assumptions are right or wrong, you must identify the data to collect and how you will collect it to validate or invalidate your assumptions (See Figure 1 – Assumption Validation Process). Some assumptions are more important than others. For example, let’s stipulate that one of the most important aspects of your alliance value assumption is how customers will engage with your solution. To use an example from our experiences, suppose the economic model of your alliance is based on customers directly accessing your solution. Your assumption is that customers will go to your website, download your app, or maybe go directly to your business to experience the offering developed by you and your partner(s). In fact, the economic model of the partnership is based on it. It might not be so attractive if customers want it, but want it through another channel. The assumptions are then put into practice—initially in a minimally viable way so that you can learn fast what is right and what is wrong. Note that this data has to be collected in real world interactions with customers. If the data proves an assumption is not valid, you need to iterate your assumptions quickly. This cycle repeats and repeats as any endeavor grows and develops. The chief skill is not being right in the initial assumptions. No one is ever completely right with his or her first assumptions. The skill is in the ability to quickly gather the specific information you need to validate or invalidate your core assumptions. By incorporating that learning into the next set of assumptions, you will necessarily be closer to the “right” value assumption and alliance business model. With so many assumptions underlying the alliance business model, how do you determine which are the more important assumptions to validate? By following the premise of the minimally viable partnership, you have already identified them by answering the Minimal How Questions. There is, of course, a companion set of assumptions about the solution or offering itself. It is not a simple matter to understand the core assumptions about the customer need or value-creating opportunity your joint solution satisfies and decide on the alliance business model that can deliver it. The right features could override negatives about the engagement model or the engagement model could negate cutting-edge features. Fortunately, with today’s sophisticated analytical capabilities, you don’t have to guess! You can collect data on all of your critical assumptions and sort out the most important aspects to get right. In the case example above, the critical assumption was that customers want to access their solution directly. However, data gathered by the partners—from interactions with real customers—demonstrated that customers want the solution, but they don’t want to access it directly. This caused the partners to re-examine their value assumption and revise the alliance business model early in their partnership. We’ve always believed that success is driven by the ability to learn and quickly iterate the assumptions you make. The McKinsey data cited above bears out that belief. It is our experience from working with and forming alliances, partnerships, and collaborations, and entrepreneurial entities over many years that the majority of people do not take the time to identify and evaluate their critical assumptions in order to learn fast. Alliance professionals who understand and help their teams follow the assumption validation process used by successful entrepreneurs and innovators build a learning advantage that creates significant value for their companies and partnerships.